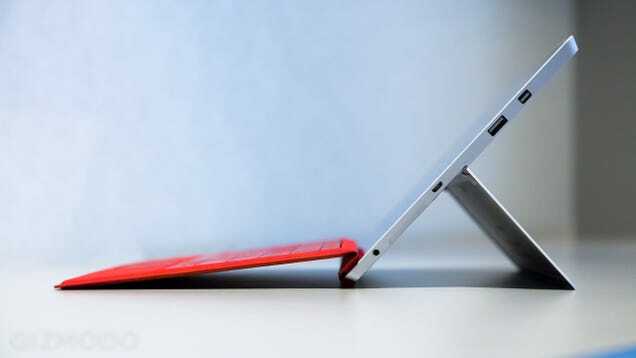 It took a couple of tries, but Microsoft finally had a critical hit with the Surface Pro 3. It was what we wanted the first Surface to be. It wasn't perfect, but it was pretty damn useable. But at £639 (and going up to £1,549), it's also expensive. The new Surface 3 is Microsoft's attempt to get in on the lower-priced action, and semi-resurrect the failed "RT" line. I got to spend a little time with it, and it makes a pretty compelling case. First, let's just acknowledge that the naming scheme is a little odd. Why is the Surface 3 coming out one year after the Surface Pro 3? Why not just call it the Surface 4 and then later release the Surface 4 Pro? Especially when Windows skipped 9 to go straight to 10. There's probably a focus group to blame for this, but I digress. Let's talk about this little beauty. For starters, the Surface 3 is the lightest Surface yet, coming in at 620 grams/1.37 lbs (vs 784 grams/1.73 lbs for the Surface Pro 3). It has a 10.8-inch 1920 by 1280 pixel screen (the Pro 3 is 12-inch, 2160 x 1440 pixels). This gives it a 3:2 ratio, for those playing the home game. 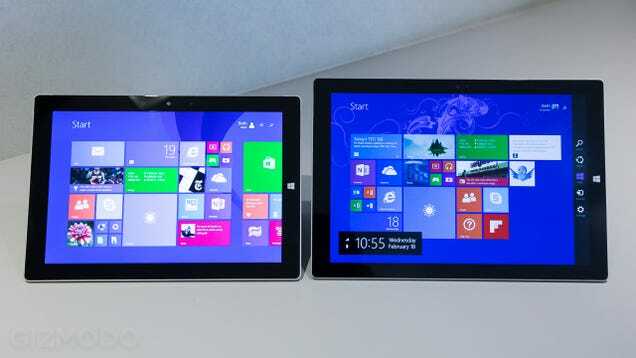 While smaller, the screen is actually brighter than the one on the Surface Pro 3 (Surface 3 is 430 nits of brightness compared to 400 for Surface Pro 3). And it will ship with real, full-on Windows 8.1 with an upgrade to Windows 10 when it comes out later this year. No, there's no "RT" this time around. 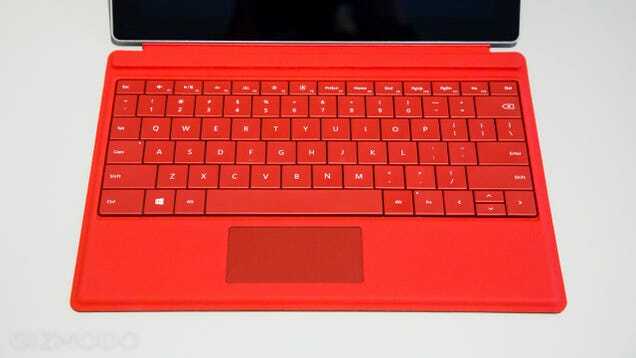 The Surface 3 uses Intel's new quad-core 1.6GHz Atom x7 processor (code named Cherry Trail). Like Intel's Core M (but significantly less powerful) Cherry Trail is a sort of laptop-tablet hybrid chip. That means it's powerful enough to run full Windows, but doesn't need fan. 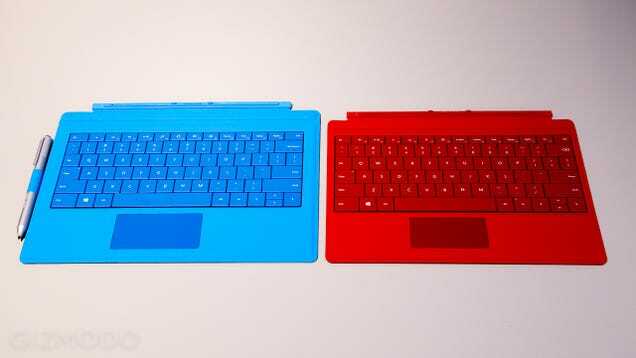 That means Microsoft was able to make it ever so slightly thinner than the Surface Pro 3 (8.7mm vs 9.14mm). Hopefully it should be easy on the battery, too. Microsoft claims it's good for up to 10 hours of video playback, which would be very solid if accurate. The Surface 3 will have a three-position kickstand that will hopefully help you find the optimum angle for whatever you're doing, and while it doesn't come with a stylus (sorry, a "Surface Pen"), it will work with one if you buy it separately. There will be LTE versions, too, for some extra moolah. The Surface also has a decent selection of ports: it has a full-size USB 3.0, a Mini DisplayPort, a microSD™ card reader, a Micro USB charging port (which double for USB 2.0 data), and of course a headphone jack; there's an 8MP camera on the back and a 3.5MP one on the front. It has it a new keyboard cover to fit its somewhat diminished size, which will be sold separately, but if you're buying a Surface then, come on, you're obviously going to get it. The tablet/laptop hybrid thing is its whole raison d'être. Anyway, I've spent a good amount of time typing on the Surface Pro 3's keyboard, which I thought was very good, and I can tell you that the Surface 3 Type Cover is noticeably better, and that's despite it being smaller, which is really impressive. The biggest difference is that the keys have more travel, better click, and just feel awesome to type on. I was able to blaze through some text almost immediately. I actually started chuckling as I remembered how much I hated typing on the original Surface keyboard. This new one is extremely useable. The track pad also has more click, and it has a really nice texture that my finger glided over very easily. And guess what? The Surface 3 itself charges via micro USB, too. Another proprietary charger, dead. Yes. Kill them all! It'll come with a 13-watt rapid charging micro USB power supply (2.8 hours to full charge), but it will still charge via any micro USB. That means if you're stuck in an airport and you didn't bring your charger there will be ample means to juice up. The Surface 3 will run full Windows programs (as well as tablet-style apps), but let's be clear: it doesn't have the computing power of the Surface Pro 3. The Atom line just doesn't have the torque that Intel's i5 and i7 do (which are available on the Pro 3), and the Surface 3 has less RAM, too (see specs and prices below). If you're hoping to use this thing for HD video editing with Adobe Premiere or play the latest, graphically intensive games, you're going to be disappointed. The Surface 3 is more for light work and light play. Word processing, web browsing, video watching, getting work done, you know, the stuff that most people care about. The good news is that it seemed to do all of that stuff pretty well. Now, I was only able to spend about half an hour with it, but during that time I found it to be fast and smooth. Apps opened quickly, programs ran fluidly, and the touchscreen seemed to be nice and responsive. Admittedly, Windows 8.1 is not my OS of choice, and the Surface 3 doesn't make it magically amazing, but we have high hopes for Windows 10, and if this machine can run it well, that could be a very nice combo. While Atom-powered Chromebooks have come a long way, they certainly don't have nearly as much functionality as the Surface 3 for the chipset to to try and handle. The Chrome OS's selection of programs just isn't quite as robust. Overall, my impressions of the Surface 3 were positive. It just feels so much smaller and lighter than the Pro 3 or a typical ultrabook. It still definitely feels big for a tablet, though. Compared to, say, an iPad, Google's Nexus 9, or Sony's Xperia tablets, it's definitely big and heavy. But still you could easily toss it into a backpack and forget it's there. It seems like a great "just gotta get some work/email/writing done" laptop, and I could see it eating a bit of the higher-end Chromebook sales, or being an apt replacement for cheaper laptops. It's almost like an underpowered version of the new Macbook, repping portability over processing power. The Surface three comes in a couple configurations. For £459 you get 4GB RAM and 64GB storage, or for £499 you get 4GB RAM and 128GB storage. You can also add LTE to either of those, though the UK price for this in unconfirmed at present. The Surface 3 is scheduled to be released on May 7th. We'll be putting it through its paces between now and then and will hopefully be able to let you know before too long whether or not this thing is worth buying. Again, I only spent a brief time playing with it, but I kinda liked the lil' guy.